At the end of the season we had one of our all too infrequent 'Bloggers Armed Ramble' where The Bambi Basher, Mc Shug and your pal SBW took a walk in the woods, giving the dogs one last romp and taking potshots a Tree Rabbits and Woodies. As we were about to call it a day, with nothing in the bag, McShug produced this beauty from his game pocket saying" You said you'd always wanted to scoff one - its had a week, pongz a bit" and I became the proud [if slightly smelly] owner of a Woodcock. 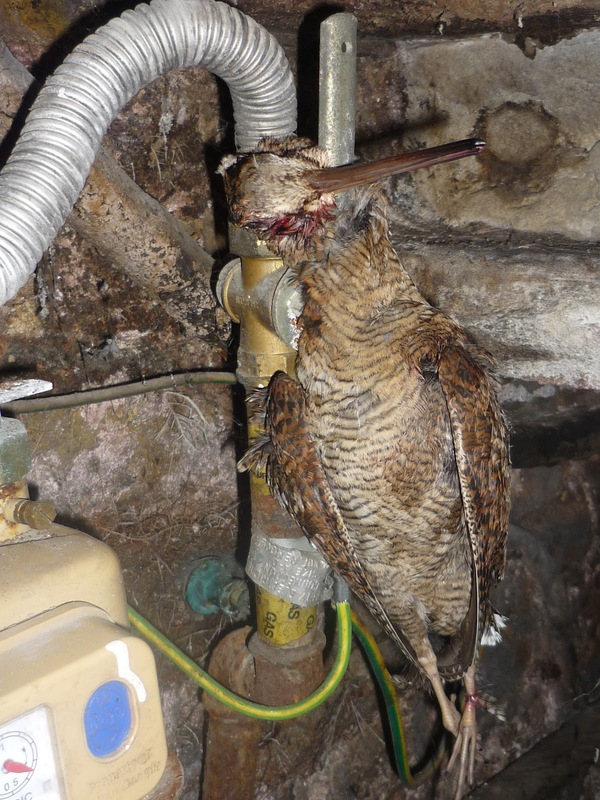 The Woodcock had been hanging for week when I got it, I hung it it until that well known barometer of ripeness - more than one flat mate asking about the smell - announced it was freeze-it or eat-it time. 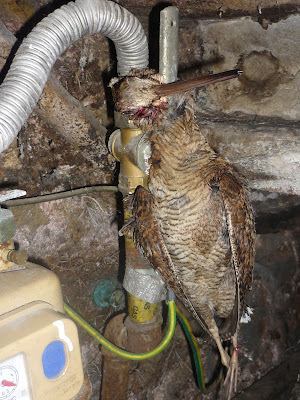 In old Blighty legend has it that a Woodcock should be nailed by the beak to a post in an out-building and only cooked up when the body falls from the head. Sadly that's about two weeks longer than the flat mates patience, so mine was ripe but not maggoty. I saved the head for an art project, but when roasted the birds skull should be split in half and using the beak has a handle the roasted brains should be sipped from the halved skull. The Woodcock is an almost mythic gamebird, after a solitary migration in early November they over-winter in woodlands, living in a scooped nest on the ground and feeding mostly on earth worms, until the frost hardens the ground when as needs must they eat seeds and berries. In a very harsh winter even visiting bird tables. McShug took this one with 'the wife's 20g semi', and over the years I've seen a few versions of the 'woodcock gun' all short-barrelled fast-to-the-shoulder shotguns, with Berretta even making a specialised set of rifled shot-dispersing barrels for their Ultralight [mmmmm want]. As bursting from the ground cover a Woodcock famously zig-zags though the woods at alarming speeds they are often many many outings and indeed cartridges to the bird. What has to be the most exclusive of shooting organisations is dedicated to this elusive bird. Since 1949 the Shooting Times Woodcock Club has welcomed members ONLY when they have pulled off a 'left and a right' without taking the gun from the shoulder, and done so in front of two witnesses. With its well deserved reputation as the ultimate gamebird I wanted to savour the full experience, the bird seasoned with just salt, cooked whole and served 'old's cool' with its guts as the seasoning. The guts are very very strongly flavoured, a potent, forceful taste of the woods, they wont be to everyones taste, think of them as a woodland caviar. Thigh and breast of woodcock, Black pudding [aka blood sausage aka Boudin noir], roast aubergine and browned halloumi, and for the dipping sause a reduction of pan juices with unsalted butter and woodcock guts.